NOTE: I have gotten back some comments from RP3 users that I have incorrect and out dated information about the RP3 in the comparison table. I’ve removed the table until I can get it updated. I really appreciate the feedback and please check back in a day or so. I was contacted by Matt Roach in a comment to one of my blog posts. Matt is a principal in Oartec. He asked if I would try out the Oartec DX. After a bit of logistics, I picked up a loaner from the Riverside Boat Club in Cambridge and dragged it back to my basement to give it a try. My first impression, seeing at Riverside, was a fear that the Oartec DX wouldn’t fit into my car. It’s pretty large from front to back…7′-8″ long. For comparison, the C2 dynamic is 6′-3″ long. Thankfully, the Oartec DX is a bit lighter than the C2Dynamic (78 vs 92lbs). Neither machine is one that you want to move around by yourself. It certainly made me appreciate that the Concept Model D breaks into 2 bits for transport. In the end, with a bit of fiddling, it all worked out. I have a mid-size SUV and to get it in, we had to recline the passenger seat all the way and let the rear end of the Oartec rest on that. But we were able to close the lift hatch and I was on my way. I managed to drag the machine into my basement without breaking it, smashing any walls or giving myself a hernia and set it down. Here is where I can really see one advantage versus a c2 with slides. All I needed to do was make sure it was about level and I was ready to go. No finicky alignment phase with the slides. Here it is in it’s temporary home. The build quality is very good. Very similar materials, fit and finish to the C2. The machine feels solid when you sit on it. The handle seems to be steel tubing. I think it’s a bit heavier than the c2 handle, but I didn’t weigh them to compare. I believe it would make a better murder weapon than the c2 handle. 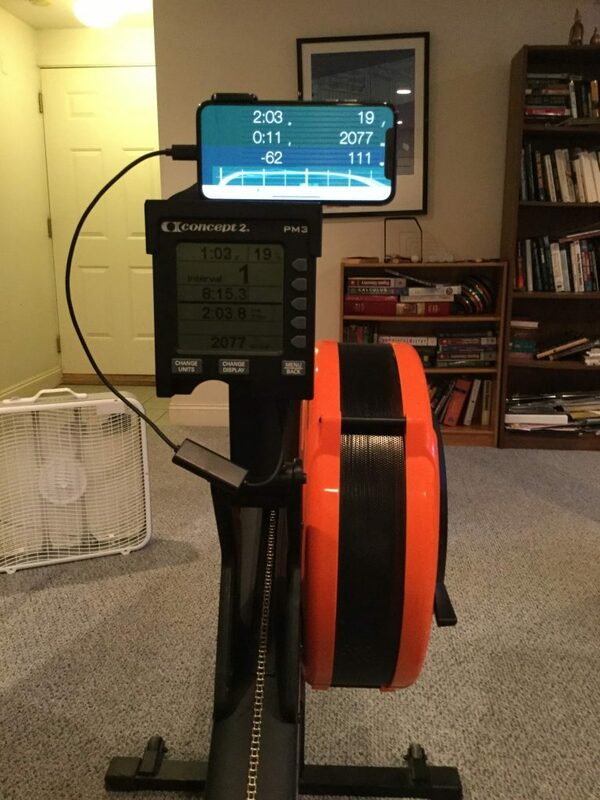 The erg uses a “floating head” design like the Row Perfect. In this design, the foot stretchers and the fan assembly are mounted on a rail. The seat slides as well. When you take a stroke, your feet push the foot stretchers / fan assembly away from you as the chain is pulled out and accelerates the fly wheel. The return tension on the chain and your feet in the stretcher draw the head unit back toward you on recovery. There is a nifty little hook that allows you to hold the head unit in position for storage and transport. The seat is squishy. I wasn’t sure about how I felt about it at first, but I found that I was comfortable, and I was tending to sit more erect on it over a one hour session. I’m sure that some folks will love it and other will hate it. I am more in the love camp, but I have a fragile, 55 year old derriere. We’ll have a longer talk about the monitor in a minute…. I sat down on it and pulled a quick piece just to get an idea of what I was dealing with. The feeling of an erg is a curious thing. Partly driven by scientific principles, partly by engineering and partly by emotion. There is a delightful thread over on the rowing google group, if you are inclined to dive down the rabbit hole. The upshot of all of this is that the feel of the erg is related to how much mass you are trying to move when you push on the foot stretcher. In a static erg, the foot stretcher is fixed in place, so essentially the mass is infinite. That means that your body moves back and forth on the slide. When you arrive at the catch, your body needs to decelerate from the recovery, and accelerate in the other direction. 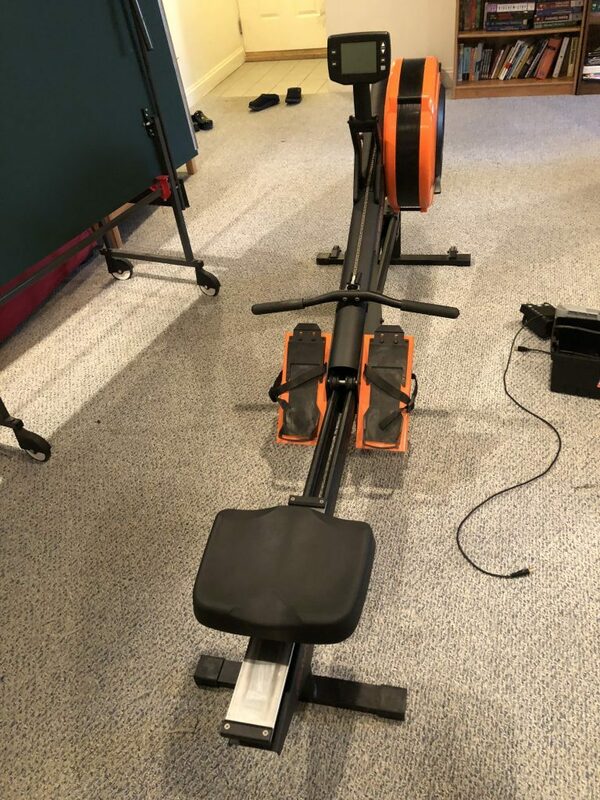 On a dynamic erg of any kind (C2 Dynamic, Model D on slides, RowPerfect or Oartec), the foot stretcher is free to move and the seat moves much less. This difference tends to make the leading edge of the force curve on a static erg a bit more gradual than on a dynamic and for the catch on static erg to feel a bit slack. Distinguishing between the feel of different kinds of dynamic erg boils down to two factors. The first is the amount of moving mass and the second is the efficiency of the mechanical system. In terms of mass, using a Model D on slides has the highest mass. The product weight is 57 pounds. everything except the seat and handle is moving on slides, so probably about 50 pounds of moving mass. On the Concept2 Dynamic erg, the moving mass is just the weighted foot rest, which I’m guessing is about 20 pounds. The Oartec and the RowPerfect are in between, with a moving mass of 42 pounds. The implication is that the leading edge of the force curve is sharpest on the C2 Dynamic, and shallowest for a C2 on slides. What does mean in terms of feel? On the C2 Dynamic, you feel the load instantly at the catch. With the Oartec DX, it feels a bit softer at the catch. With slides, it is softer still. And if you go use a static erg after using any dynamic erg, you notice a pronounced lack of connection at the catch. It feels downright mushy. The second factor is mechanical. This is really just a knock on the C2 Dynamic. The RowPerfect, the Oartec DX and the C2 on sliders all have a chain driven air resistance fly wheel with some sort of a spring tension return. The mechanism is very simple. On the C2 dynamic, there is a complex arrangement of ropes, pulleys chains and springs to allow both the footrest and handle to “float”, but be linked together. This system adds friction and noise. It makes the machine feel heavier than the drag factor that is programmed. 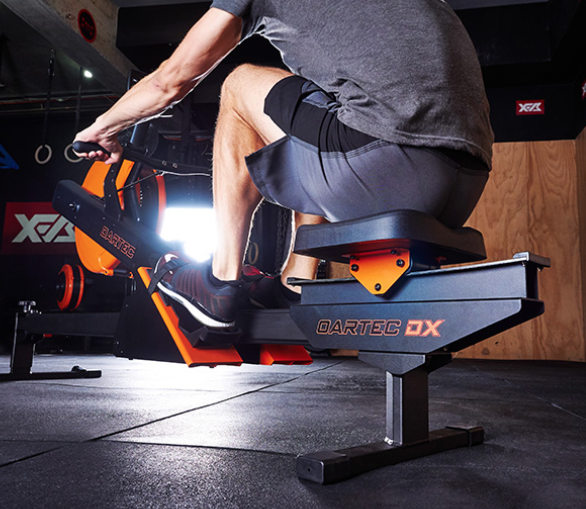 The Oartec DX has done something clever with the seat. On the C2 Dynamic, there is a short shock cord to constrain the seat movement. On the Concept2 slides, there is a set of thin shock cords that keep provide a bit of centering force for the erg. On the Oartec DX, they actually use a gently curved track. This provides a slight centering force, but allows the seat to move during the stroke which encourages good stroke mechanics. I found that the machine definitely rewarded good form. When I was careful sequencing my recovery, the seat was nice and still. If I rushed the recovery and broke my knees early, I could feel the seat moving toward to the head unit. It was really good feedback. So, it term of rowing motion, the machine is a winner. I would be equally happy rowing on an Oartec or on a Model D on slides. Either is much better than the Dynamic or a static erg. It’s tough for me to be really objective about the monitor. I’ve spent many years using the Concept2 rowers and I am very used to the way that the PM works. It isn’t exactly user friendly, but once you know how to use it, it provides a lot of functionality, and importantly, it is the gateway to using the online logbook, and almost all indoor rowing applications. The Oartec monitor looks and works a bit like PM. It doesn’t have the set of buttons down the right side of the screen to pick options, but three function buttons are familiar. What can it do? The purpose of the monitor is to sense the tachometer output from the spinning flywheel and convert that into power. The accuracy of the power measurement is related to the inertia of the flywheel. As long as that is consistent from machine to machine, everything else can be calculated by the monitor. The Oartec monitor certainly does that. It also provides a real time display of strokes per minute. It will remember summary stats for your row. Note: Since I have picked up the machine and tried it out, I’ve been in contact with Matt Roach. He has sent me updated firmware for the monitor that I will try out as soon as I get a chance. He tells me that this version has support for fixed and variable intervals and some other new features. So, the monitor provides what you need to be able to use the machine perfectly well as a stand alone piece of equipment. I worked like for years when one of the machines that I used had a PM2+ on it. I programmed my sessions, wrote down the results and made great progress. It was my main training machine when I set my 2k personal best time. So, the monitor will not hold you back. But, at this point, I have become very accustomed to being able to review my training in detail after the session. 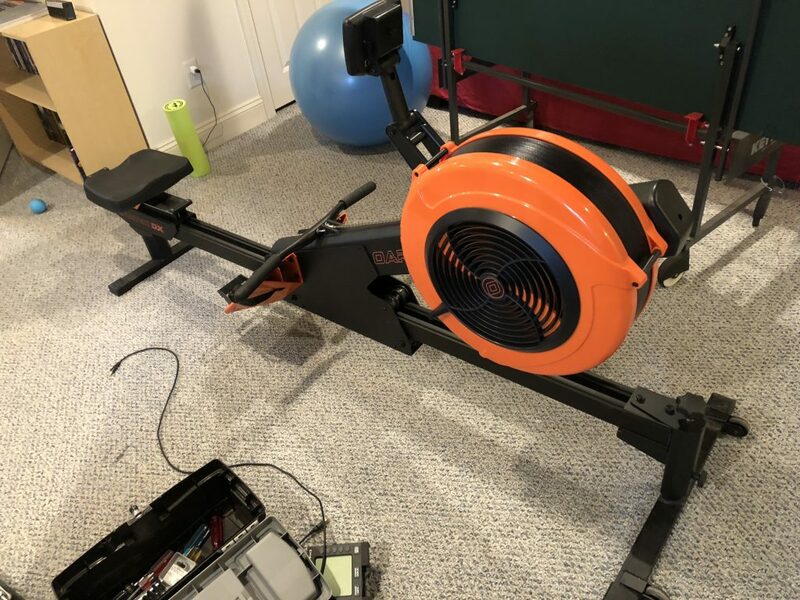 To do this I use applications like ergdata and painsled and these also allow me to automatically log my sessions on the concept2 online logbook and Strava. The lack of connectivity provided by the monitor on the Oartec seemed like it would be a big issue. But it turns out that it isn’t. There is an easy work around. 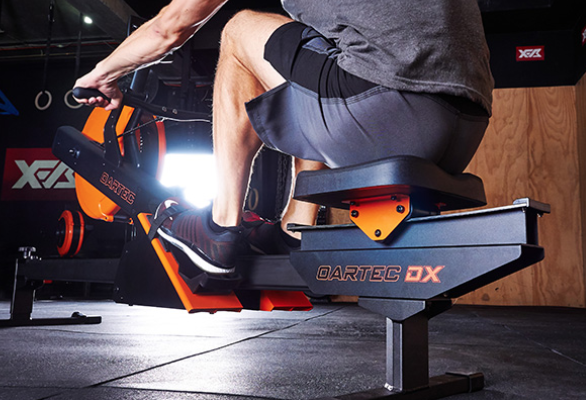 The Oartec DX is 100% compatible with Concept2 performance monitors. The tachometer output is electrically the same as the one on the Model C erg. The plug on the Oartec mates precisely with the jack on the PM. Even the bracket on the Oartec has exactly the right spacing to accept a PM. I happened to have an old PM3 lying around, so within 5 minutes, I had the Oartech looking like this. Yep, that’s a PM3 with a USB cable to my phone running PainSled, it will work with ergdata or boatcoach too I assume. Ahhh, it was like coming home. With the PM3 in place, I set the drag factor and took a few strokes. The splits looked about right and the stroke rate seemed OK too. Even the force curve looked right. I have not done this specific workout on slides or on the dynamic. I have done it before on a static erg. I was a bit more taxed doing the session on the Oartec, but I was able to hit my targets. I think it was basically lined up with my performance on slides, and way way better than on the dynamic. I will try to take a better video later, but for now, here’s a quick one that I took after that workout. It’s about 30 seconds of low rate and then 30 seconds of r30/1:45 pace. Of course, I don’t think it would be fair to use the Oartec with the PM to rank pieces on the C2 logbook, but I think the results would be very close between the two machines. Certainly close enough that you could use them interchangeably in training sessions. 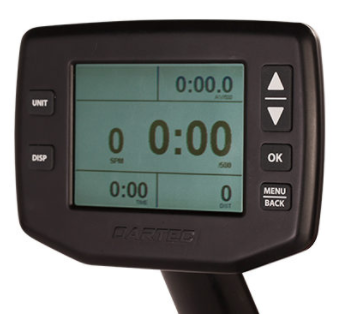 Even if you add on a PM5 ($180), the Oartec DX is still a LOT cheaper than the RowPerfect. So, would I recommend the Oartec DX? The Oartec does a better job simulating OTW feel than the C2 Dynamic or a Model D on sliders. It is also smaller than a C2 on sliders. If you are training on your own, and being a part of the Concept2 “ranking community” is not important to you, then the Oartec is a really good option. With the PM5, you can do everything that you would do on a Model D on slides, or a dynamic, but you shouldn’t use it for online competition. If you are thinking about spending three grand for an RP3, then I would definitely consider an Oartec with a PM5 as an alternative. It’s a lot cheaper, and it will be easier to go back and forth between it and C2 static ergs. I’ll update this with more info as I try out more types of sessions on the Oartec. I will also update it after I try the Beta Firmware.